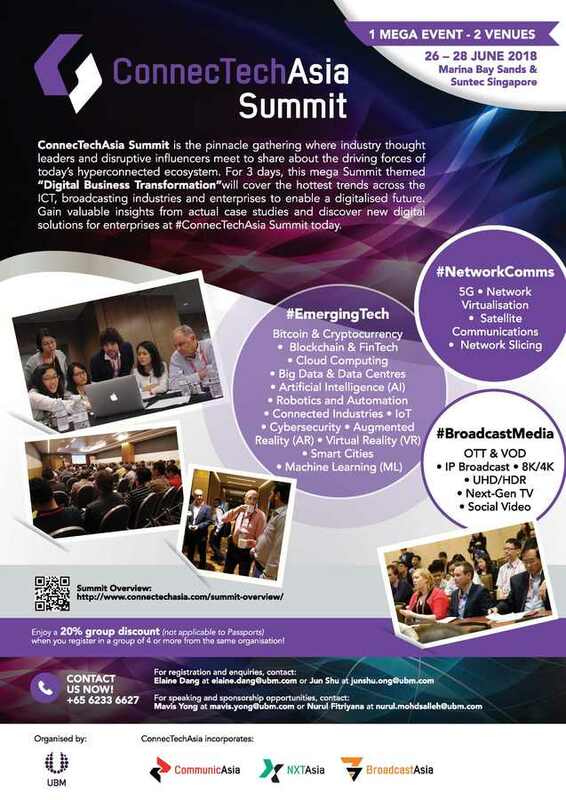 Happening at 2 venues across 3 days, ConnecTechAsia Summit gathers disruptive movers and shakers from Asia Pacific and the world! Learn and hear from top-notch speakers who will debate and share their experiences through tracked sessions and plenary stages happening this 26 - 28 June 2018 at Marina Bay Sands, Singapore! Key Focus and Technologies - What’s new? View confirmed speakers and more here. For the detailed Summit programme, please click here. Register now with Super Saver Rates (ending 16 Feb!) and save up to SGD900! Quote ‘HKFEC’ now to enjoy a 15% discount* off the registration fees (*discount not applicable to Passports)! For further enquiries, please feel free to contact Elaine Dang at +65 6233 6627 or email at elaine.dang@ubm.com.